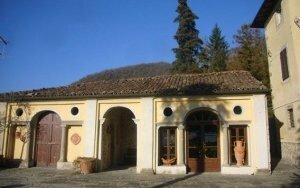 914 A 50s small villa with art déco details, located in residential area in Barga, Lucca. The house is set on ground floor, basement and attic. The building, of 170mq, has two entrances, one on the frontal facade, one on the back, and it is situated in a fenced-off garden of 1500mq. A few steps leads to a paved space where it is the main door. Inside the house there is a wide hallway that links the rooms. On the left there is a spacious living room of 36 mq and on the right there are two bedrooms. At the end of the corridor, there is a passageway which leads, on the left to a bedroom, ahead to a bathroom and on the right to a wide dining room. This space has an access to the kitchen and one to a box room. In this box room there is the secondary entrance which leads to a loggia and then to the garden. Attic: in the passageway, there is a manhole with retractable ladder which leads to the attic here some spaces are in part viable. The roof has been recently renforced and completely consolidated. Basement: The access to this space is via a staircase in the passageway and via a door in the garden On this floor, the layout mirrors the one of the ground floor, so there are many spaces which lend themselves to become a pleasing area of the house. 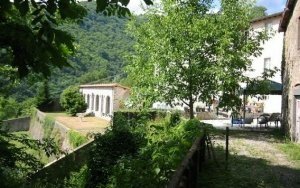 The spacious panoramic garden has a splendid view of the Duomo of Barga, one of the most beautiful village in Tuscany. Here there is a garage and a paved space where it is possible to park the car. The garden is populated by different plants and trees and two small greenhouses. unique opportunity to redevelop a historic palazzo, of 1'000mq. 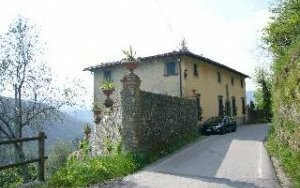 with several hectares of land.